During a recent trip to Japan, Tesla CEO Elon Musk says his company and Toyota could team on another “significant” joint project in two or three years, and at higher volumes than the soon-to-end RAV4 program. Musk’s comments came just four months after Tesla Motors Inc. announced that the agreement to supply battery packs for the electric Toyota crossover would finish this year with sales around 2,500. Musk said there were no concrete plans for a new vehicle with Toyota but dangled the possibility of a bigger project soon. “I think that if you look out maybe two or three years from now, that I would not be surprised if there is a significant deal with Toyota,” Musk said today at a ceremony to deliver the first Tesla Model S sedans to customers in Japan. “My best guess is that it would probably be something significant, maybe on a much higher volume level,” he said. Toyota Motor Corp., which owns 2.4 percent of Tesla, said in May 2012 it envisioned building around 2,500 RAV4 EVs over three years. When the partners announced in May that the program would wrap this year, they were noncommittal about future projects. The Japanese and American companies have since sparred over alternative visions for tomorrow’s alternative drivetrains. Toyota spokesman Dion Corbett said the world’s biggest carmaker had “nothing to say” in response to Musk’s latest overture. 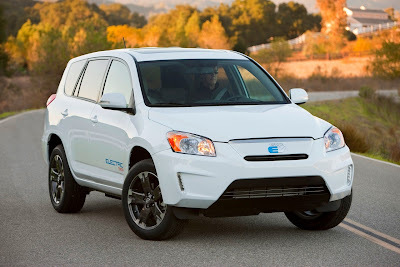 Toyota sold 2,130 RAV4 EVs through August. The company expects to sell the rest of the planned 2,500 by year’s end. After those are delivered, Toyota will have neither a single EV nameplate in its lineup nor public plans to add one. Musk was not expected to meet with Toyota officials during his visit to Japan. While in Tokyo, he handed over the keys to nine new Model S sedans on the 52nd-floor observatory of Roppongi Hills Mori Tower, one of the tallest buildings in town.